See TSBs and recalls for the 2016 Jeep Wrangler. Chart based on 13 repair trips. The repair cost chart excludes repairs made under warranty, do-it-yourself repairs, and repair trips that include maintenance. 8000 mi The transmission would pop out of 4th gear, and make noise while in 3rd gear. They pulled the transmission and replaced the synchros. Repair was not successful. 14784 mi When going up hills in 3rd under partial throttle there is a rattling sound. The transmission would pop out of 3rd and 5th with the slightest bump. 15000 mi (Manual transmission) Weak or damaged grommet guiding clutch fork into gears shattered and shifter would slide all over the place making shifting into specific gears rather difficult. 2000 mi Replaced seals on freedom panels of hard top. 11600 mi Wheel speed sensor failed in left rear tire. 1000 mi Air in the cooling fluid. System purged. 12000 mi Carpet has been separating from middle console. Carpet was pushed back in place. Hopefully it was also secured to keep it from happening. 1000 mi Check engine light came one, code pointed to intermittent misfire. Software update resolved problem. 6000 mi Check engine light for P0441 evaporate code. Replaced bad fuel tank pressure sensor. 20000 mi Nav kept freezing (buggy Garmin software). Dealer replaced radio under warranty. Problem has not appeared since. US $3600 I bought a 3rd party stereo and replaced it myself. The radio/nav would routinely lose all settings and then the touch screen stopped responding. The dealer responded that the screen was damaged and thus the warranty was void, and they wanted $2,800 for replacement. US $100 Radiator was leaking. Mopar extended warranty covered all costs after $100 deductible. 16000 mi Check engine light came on, showing code P0441 (Evap system). Dealer "tested" and found no issue, and just reset the code. Driver's power window would snap upon roll up. Been an issue since day one, but not worth a special repair trip. Dealer had for a day, and said it was the glass carrier plate, order the part, and installed. Used the window twice before the same noise showed up again. Crappy dealer work. 7000 mi Defective hard top seam allowed water to enter cabin at left rear corner. New hard top replacement. 6000 mi Emergency brake not holding when vehicle parked on a hill. Vehicle was "fixed" by dealer. Took the Jeep home and noted the handle still wasn't correct. Took it back a second time and problem was fixed. Radio (730N) would not charge phone through USB port. Radio would not play music through USB port. Dealer diagnosed problem with a grounded USB port. Ordered part (new radio) to be put on at a later date. After the first trip when parking brake was "repaired" by dealer I noticed my brake handle would not go down all the way and would move up and down without initially engaging or disengaging the brake). Dealer replaced a broken spring. Radio (730N) was replaced after parts came in. The initial problem from the previous trip was a shorted USB port. 21000 mi Radio continued to be an issue throughout the ownership of this vehicle even after complete head unit replacement. 12000 mi A/C spontaneously came on during rainy weather. Myself and dealer thought it was a malfunction. 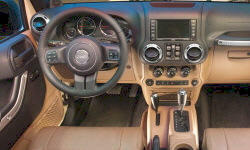 Jeep engineer said it has a humidity sensor that turns A/C on to keep windows clear. Prior repair attempted by replacing HVAC control panel. 35000 mi Clutch made noise when engaged which was only noticeable when engine was off. Throwout bearing replaced. One element of the rear window defogger was not functioning. It was repaired. 32000 mi Engine Cooling System - Radiator developed a small leak, to where you could smell but not see antifreeze. Upon inspection, it was determined radiator had a leak and was determined to be manufacturer defect. Covered under warranty. US $45 Rear Brake pads worn down to the 'squealer' so replaced these, Rotors were still almost perfect, so did nothing here. 70000 mi Manual transmission keeps popping out of reverse and sometimes makes popping noise when taking off in 1st gear . Diagnosis by dealer indicated Transmission needed to be repaired, so they put in a new one under warranty. 31700 mi Rear axle seals leaking. 39680 mi Had a check engine light appear, but dissapear within the same day. 62000 mi Wasn't getting heat on the driver side. Dealer inspected the system for leaks and flow and found no issues. C $500 Dealer said A/C compressor seized. The problem is related, but I can't prove it. 41300 mi Passenger rear axle seal was leaking after off-road trip. Dealer replaced seal, bearing, and race under warranty. Repair was completed same day. 21200 mi Manual transmission, pops out of 1st gear on start from stop. Replaced syncro gear, problem still happens. US $100 A bolt holding the Axle to the spring mount had broken. This was after a trip on the Dalton Highway. 2000 mi Dashboard fuel, engine,brake light on. Car goes into limp mode. Not repaired. This happened on three different occasions. 10400 mi Hard top was leaking just above the interior mirror. Has not leaked since. Gearshift lights not working Headlight retaining rings covered in rust when only a few months since delivery. I only noticed this when I changed out OEM headlights for LED set. Poor quality chrome job! 8000 mi rear left seat belt, once hooked up, will lock and does not allow passenger to move unless seat belt is removed and re connected. Then the problem starts almost immediately when the vehicle is moving,. 15000 mi No Map Data Available on the 430N radio with the Garmin GPS system. The problem goes back to 2012 with Chrysler products. Awaiting new radio with no date for getting one. 16000 mi extreme water leaking inside cabin from the drivers and front passengers door Previous repair of the radio gps system failed and while awaiting a new radio/GPS the satellite radio system failed. After several months delay the 430N radio with Nav and SAT service was finally replaced. I now have a good GPS system. 7000 mi The engine started slowly leaking oil at 6000 miles. It appears to be a rear main seal leak. Dealer mis-diagnosed problem as oil pan leak, even after dye was added to the system. I'll wait until the mechanic is less busy and bring it back. 9500 mi Brought the car in for the same oil leak as the June trip. They confirmed that the rear main seal was bad and replaced it. 12500 mi Check engine light came on showing code P300 multiple cylinder misfire. This code came and went twice over the course of 2 weeks. No noticeable symptoms while driving (this is how it always starts). Dealer applied software update that supposedly resolves this issue. I'm worried that this software buffers the problem and that it will get worse in the future. 6820 mi Passenger door would not open except from inside handle. Very awkward in grizzly bear country when getting in and out to take photos. It was not repaired and we traded on 4Runner as is. 17000 mi Smelled coolant. Dealer performed radiator pressure test. No leaks found. 31000 mi Battery completely discharged. Dealership tested and confirmed, replaced battery under warranty. Dealership confirmed that it was not a vehicle issue, just a bad battery. 26000 mi Small leak in cooling system found by antifreeze smell when pulled in the garage. First trip to dealer to find problem, then they had to order part for radiator. 2nd trip took about 6 hours to fix problem. US $240 31 days after purchase, a faulty battery left me stranded and required a tow. I didn't drive the three hours to the dealer just to replace the battery. Owner purchased and installed replacement. 21000 mi A bead of sealant was installed on the top of the drivers door to stop water from leaking on the drivers floor. 45000 mi Pentastar left cylinder head problem. Received random misfire codes for two months. Then got specific codes:302, 304. Misfires in 2nd and 4th cylinders. Dealer replaced cylinder head under warranty. Additionally replaced all lifters and rockers. Known problem with pentastar engines. 27280 mi Traction control / ABS light came on. Wheel sensor had to be replaced. Tech noticed that the wheel bearing was loose so replaced that as well. When repairing wheel sensor for traction control / ABS. C $1000 Ball joints worn beyond spec on one side. 5000 mi External temperature sensor replaced, new one is just as inaccurate - due to placement of the thermocouple it picks up engine heat when low speed or sitting. 15000 mi AC Heat diverter stopped working. Was replaced under warranty. 6000 mi oil leak....after an oil change, I noticed a bad leak...took it to dealer, who said it was a oil filter gasket failure. Replaced gasket. 14800 mi Kept smelling coolant after driving. Coolant level became low over time. Found dried coolant on bottom or radiator. Took vehicle to dealer who replaced radiator under warranty. 31000 mi Nav stopped working. Couldn't load maps. Found audio head unit faulty. Ordered new radio. New audio head unit installed after nav stopped working. 1000 mi I had a bad rattle in the passenger kick panel area. I found a wiring harness connector that was never installed into its spot rattling around. I installed it into its holder and the rattle stopped. 29700 mi Radiator cap blowing off steam as if over pressurized and bad smell of coolant. After pressure checking the radiator the dealer replaced radiator cap with a higher PSI value. Problem reoccurred about a week later. Dealer replaced radiator cap with an even HIGHER PSI value. Problem has not happened again. 79000 mi Had a coolant flush performed on the vehicle. As a result, the radiator started leaking. Dealer replaced it on their dime. 80614 mi Jeep did not have warning chime. Dealer diagnosed and replaced instrument cluster at their expense. US $100 Soft top was leaking. Needed new foam kit installed. 8000 mi Thought doors were always open even though they werent - they replaced the central locking system's computer under warranty. 7840 mi Water pump had a leak, they replaced the thermostat as well. 23000 mi Aux port on radio was lose and not functional. Radio replaced under warranty Radiator leaking. Replaced under warranty Hinge on rear hatch made a popping noise when opening and closing. Hinge replaced under warranty Squeak coming from rear suspension over bumps. Rear sway bar links lubricated under warranty. 15168 mi Water Pump replaced - was making screeching sound since 12,000mi but part took time to get in/coordinate repair. US $120 Rear window showed signs of water leak. Asked dealer to take a look when doing oil change. They ended up charging a diagnostic fee and repair time to wipe dust off of the gasket. It still leaks. 21206 mi Extremely loud creaking sound like a wooden door when on uneven ground (eg. driving up onto street off of dirt road or pulling up on curb (any "Flexing"). Dealer applied a lot of grease to door latches, problem solved. 25377 mi Heat did not work, just blew cold air. Dealer replaced thermostat and some coolant hose. Heat works, but did not work as well as before. Returned and they added more coolant. 35000 mi Blend Door Actuator failed/broke. Was 50*F outside, and vehicle had no heat. Second time during ownership with no heat, different problem this time though. Currently makes odd belt noise when AC on, will fix at next oil change. Power Steering intermittently cuts out, or becomes hard to use. Able to demonstrate at higher RPM, but was told this is "Normal" by dealership. Vehicle did not do this before, will make them replace when it fails. Vehicle makes loud whining noise (similar to a supercharger) when AC is on coldest and fan 1/3 or higher up. Directly tied to engine RPM, noise is present from 2.5-3k RPM and higher. AC stopped blowing cold air for 1 minute but resumed. US $100 Replaced AC compressor and expansion valve. While in for AC Compressor replacement, determined leaking radiator. While in for AC Compressor replacement, determined leaking front axle seals. US $208 Front Axle Seal was leaking heavily. Replaced axle seal (had previously been done 3k earlier). Oil Pan was leaking oil from the gasket/seal area. Pan was coated in oil, and oil was creeping vertically to the underside of the vehicle. Steering made loud clunk when wet, vibrated steering column. Track Bar was tightened, charged $208 because dealer did not replace any parts and wouldn't cover labor under warranty. Noise began almost immediately after prior repair. 11500 mi Speed sensor, left rear replaced. 14000 mi Rear window defroster / defogger power cable came loose from window. Rear window assembly replaced. 16000 mi Defogger/defrost cable came loose on rear window. I soldered the connection to save a trip for another window change out. 24000 mi Passenger side water leak around door and dumps onto floorboard. I applied silicon to an area to see if that works, also purchased a new door gasket but have not installed it yet. Occurs mostly during heavy rain and parked on flat driveway. US $35 Replaced the front door gasket on passenger side. Only leaks during rain and parked. Water was always a puddle on floor mat. The new gasket did not help. Not successful. US $21 Wheel speed sensor on left rear wheel. Caused ABS system to fail. Had to fine a shop that could read ABS problems and identify which wheel was causing the issue. Traction control and ABS lamps on, pulsing brakes and erratic engine power. 41000 mi Repeat repair attempt for check engine and traction control warning lights. Replaced cam position sensor for third time in two months. Second attempt to solve check engine light with traction control/anti skid light. Replaced cam position sensor (second time, was told the first sensor might have been"just a bad part from mfr") took two weeks to get part. 43000 mi Third attempt to solve check engine light with anti skid light. Replaced "other" cam position sensor. Took over two weeks to get part. Car was marginally driveable, sometimes in limp mode. Lights came back on on way home from dealership. Fourth attempt to solve check engine light with anti skid light. Replaced oil control valve and sensor. Drove car less than a week before same problem reaccured. 72000 mi Continuation of ongoing problem with dashboard Christmas tree and limp mode. Dealer as last resort ordered new head, found lose bolt in oil pressure supply path. 34000 mi Roar noise and harmonic vibration most noticeable at 72 MPH. Not tires. Dealer thought issue was front differential bearings. All replaced, but no improvement. Still have to take it back again. 12400 mi Oil sensor failed after regular maintenance completed. 14460 mi Leaking seals both sides front axle. Repaired under warranty. 26660 mi Leak found upper rear radiator by overflow bottle, radiator replaced, system flushed and new antifreeze filled. 26691 mi Leak found at oil cooler, tech found a few drops in engine valley. Replacement oil cooler ordered during March trip then installed 4 April 2018. 28520 mi Door hinge paint pealing due to galvanic corrosion. Replacement covered by extended warranty. 21000 mi Oil cooler housing cracked and leaked oil. 1000 mi Engine cooling system problem. 22320 mi Wire tab fell off the rear screen defroster. Defroster stopped working. 42780 mi Navigation system failed. Wouldn't connect to detailed Garmin maps. Problem is irreparable and a new radio unit had to be ordered. C $550 New radio/navigation unit installed under extended warranty Rear brakes needed repairs - rotors warped and scored. C $35 Sway bar knocking on Steering Damper on full lock. Damper had twisted in its mount. The mount was reset and tightened to prevent a repeat of the problem. C $690 Right front UV badly worn, damaged by hitting a deep pothole. Both front UVs replaced. Also had oil change and brake check done at the same time. 5000 mi Navigation system went out, replaced with a new (used) unit. screen was damaged prior to install but installed anyways. Nav now works but unit needs be replaced because of sirus not working and screen damaged. 2 replacement unit. screen was messed up on radio/nav unit. 7000 mi Water leaking on passenger side. Dealer ordered parts, still not fixed. Repaired drivers side tape for freedom top. Windshield header panel replaced. 15000 mi Freedom Panel leak, replaced header panel and seals again. Rear tailgate was making a loud noise going down the road. 15000 mi Passenger side door hinges paint was flaking. 9300 mi The oil filter housing on the top of the engine is made of plastic (of all things). It cracked open at the bottom and began leaking oil. Dealer stated this on one of many so had the part in stock. 5700 mi Transmission temperature sensor was failing. 9300 mi Oil sending failed, send a single to read full press on the gauge. 42000 mi Oil cooler/ filter housing cracked leaking oil down back of engine. US $1356 Heater core plugged. Here core replaced, and cooling system flushed. 25000 mi Surges when AC was on; repair was "a software patch." 35000 mi Surge at ~2000 rpm. Fixed with software patch. US $106 Fuel delivery line came loose from injector rail. Gas leak, strong gas smell in vehicle. Line and connector were replaced. Aug 2013 Interior squeak when traveling over bumps. Removed roof and bolts that join windshield to sport bar. Applied grease where windshield and sport bar interface and put everything back together. 1000 mi Driver seat squeaked when traveling up an incline. Found rubbing area in seat height adjuster mechanism and greased it. Squeak solved. 3300 mi I found casting sand in the coolant reservoir. The dealership flushed the cooling system twice. 4000 mi Engine oil cooler started leaking. Driver's seat sounds like a wooden ricking chair. Dealer replaced seat base. Dash trim below radio warped. Dealer replaced dash piece. 5000 mi Rear seat headrest base fell apart after first use. Hubcap fell off in pieces. 6000 mi Dash warped again. Replacement piece doesn't fit right either. Lead for rear defroster fell off of back window. Back glass being replaced but is on national backorder. Casting sand appeared in cooling reservoir for 3rd time. Drivers seat squeaking again. 8300 mi Radio bezel not fitting right. Driver's seat squeaking again. 6800 mi Radio bezel warped. Removed myself and fixed problem. 18300 mi Rear defroster lead came off again! 4000 mi Rear Main Seal Leak Trans hard to shift from 4-5-6 gears after driving on the highway for about 30 miles. 4000 mi Gear Shifter Seal not installed correctly. I had to show them how to do it. 15000 mi Engine Oil Leak. 10000 mi Leaking Oil Sending Unit & Housing both replaced by dealer 11-month old 2014 Jeep Wrangler Sport. 9920 mi Driver seat squeaked over bumps; dealer disassembled, greased, and reassembled under warranty. No charge, and no more squeaks! US $700 Ball joints on outer C were replaced by teraflex units to correct steering wobble. 25000 mi HVAC harness was loose from time of purchase (aug 2017), it finally wiggled itself free and stopped the "cool" side of the system from working. Dealer waived the labor fee since i have had all maintenance and repair work done with their shop. 22500 mi Replace battery under warranty. US $30 Replaced rear window support struts on hardtop. C $150 Front right hinge for the convertible was replaced due to wear and tear. 29000 mi leaking radiator. split seam on radiator. replaced. US $55 Oil filter assembly cracked, O ring kit put in. Failed within 4 weeks. 76000 mi Oil Filter assembly started leaking again. This time the assembly was replaced. 9700 mi Squeaky water pump. Replaced under warranty. Emergency handbrake out of adjustment. Clunking/popping noise. 32000 mi The controls for the airflow did not work accurately. Select it to blow on the floor only and came out from dashboard; put on defrost and came out on floor, etc. They replaced entire unit under warranty. US $600 Spider gears on the limited slip differential crumbled and failed, needing complete replacement. 37000 mi Star report, low heat output, manufacture says flush system and replace radiator and cap, heater core, out of warranty by 1k miles. They are only doing core, by goodwill. Entire dash and steering colum need removed. Already had over temp. 1800 mi Grinding/Rattling noise at 2k RPM in all gears of manual transmission. 2nd attempt to diagnose grinding/rattling noise at 2k RPM in all gears of manual transmission. 3000 mi Rattle at 2k RPMs in all gears. Manual transmission was replaced under warranty. US $30 Replace foam pads on removable hardtop, and placed butyl tape in door channel to stop various leaks. US $380 Parking brake not holding (manual transmission). LR axle seal leaking. Seal, bearing and collar replaced. 83000 mi Cylinder 2 misfire code. Lifter, rocker and head replaced under warranty. US $850 Radiator leaking, low coolant. Radiator replaces, cooling system flushed due to dirty coolant. 5580 mi Wind noise on driver's side plus hardtop roof rubbing on body. Dealer replaced door seal and noises have disappeared. 35000 mi Defrost light blinking after starting engine. AC would not come on while light was blinking. After 30-60 seconds, the light shut off & the AC worked. US $50 Drivers side headlight burned out. US $25 Stalling when vehicle was put from Park to reverse. Crankshaft position sensor was replaced by me and it fixed the issue. US $1900 Heater core Wipers won't shut off. Radio won't turn off. The repair was not successful. and TIPM mid. 8000 mi Oil pump sensor failed. US $500 Replaced front axle seals. Needed to remove front axle and differential to access and replace the seals. 32000 mi Water leak on passenger and driver side door panel near A-pillars since bought. 9th time it has been in the shop. Finally opened a ticket with Chrysler Corporate. Passenger front hard top was replaced and weatherstripping was resealed. Unsuccessful. 17000 mi Manual transmission sometimes pops violently out of gear when shifting to 3rd. Dealership test drove but didn't experience the problem. Reported to dealership noises from engine compartment. Brought in to get replaced. Dealership heard the chirp but didn't have the part. Was not replaced. 29700 mi Manual transmission violently pops out of gear when shifting to 3rd gear. Does not affect any other gear. Chrysler said to give it "sufficient follow through" when shifting into 3rd gear. Still an issue and is getting worse. Engine knocks/pings during acceleration. Dealership did not acknowledge the issue. Switched to 91 octane gas and the ping went away. Chirping noise under the hood, same as a previous trip which was unresolved. Asked the dealership to replace the water pump and the issue was resolved. 44000 mi Heat doesn't come out of driver's side vents and passenger side is warm at best. Found 1" sludge at bottom of coolant reservoir tank most likely from sand from factory or factory-mixed coolants. AC works fine. Dealership wouldn't cover the repair. 36200 mi Replaced squeaking idler pulley wheel under warranty. However, squeaking noise has since re-appeared so I will take it back to dealer. Update: later cleared up on its own. 5200 mi Leaking Freedom top. 11000 mi Defective oil sensor; engine light went on. US $100 Tire sensor gave false warning. 6000 mi Oil Leak from Upper Oil pan Rear Main Seal was Blown out. Upper Oil Pan still leaking. 6200 mi Upper Oil Pan Still Leaking. Dealer Put Dye in the Oil. Upper Oil Pan Leak. Dealer was able to see the oil but could not see where it was coming from. Upper oil pan leak, Dealer could not find oil leak or see the die that they put in the oil untill I made them put it back on the houst and pointed out where it was coming from. Replaced upper and lower oil pan. 7000 mi Upper oil pan leak, Dealer could not find oil leak or see the dye that they put in the oil until I made them put it back on the hoist and pointed out where it was coming from. Replaced upper and lower oil pan. 52000 mi Check Engine light turned out to be a defective head. Head replaced under warranty. US $3200 Had dealer replace radiator due to leaks, heater core, and blend door due to no heat on driver side. 7000 mi Water leaking at gasket on hard top roof, just above driver's door, towards rear. In heavy rains, water pours in! When going through water (only about 6 inches) or when spraying to clean underneath the car,hazard lights start flashing, clicking noise from dash, some changes in dashboard lighting. Would NOT attempt actual water fording in this Jeep. 3300 mi Clip in dash replaced by radio. 9000 mi Left head defective. OBD II Code P302. #2 cylinder misfire is the first warning sign of the defective left head. Replaced under factory warranty. 12000 mi Oil pressure switch went bad. Dealer replaced and broke the knock sensor. Which had to be replaced a couple days later. Dealership Technician damaged the knock sensor in the process of replacing the Oil Pressure switch. Knock sensor required replacement. 1300 mi The heater core sounded like water was running through it on cold start, air was getting into the cooling system because the factory left the bleeder valve on the radiator open. 3300 mi The dash had to be replaced because it wouldn't stay attached to the vehicle. I asked them to order the part and they replaced it in one visit. 5000 mi The passenger side tail lamp was allowing water to pool inside, it was replaced under warranty. The wireless control module (controls the engine anti-theft system) had to be reflashed to solve a hot no-start issue. 35000 mi Heated seat control module failed. Under warranty but still waiting, three weeks now for back ordered module. 36000 mi Heated seat control module replaced for second time under "goodwill" warranty after repeated complaints to regional manager of FCA. Star program update to different part number for heated seat control module was overlooked by first dealer. 56500 mi Persistent rear cargo door rattle. Lots of documentation online with stupid fixes like electrical tape and self adhesive felt pads. Found Mopar factory rear cargo door adjustment procedure, followed the tedious steps to a successful fix. Not for the mechanically uninclined or impatient. See our lemon odds and nada odds page to see vehicles with no repairs or vehicles with more than three repairs. 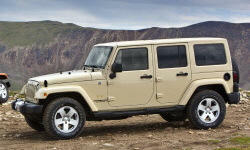 To see how frequently 2016 Jeep Wrangler problems occur, check out our car reliability stats.